I'm taking new clients. To get started email me at chris@succeedsocially.com with a brief overview of what issues you'd like help with, and any questions you might have. You're nervous around people. You worry all the time about how others will judge you if you say something wrong or look anxious in front of them. You often can't work up the courage to start a conversation with someone you don't know. When you're talking to people your nerves sometimes make your brain lock up. You avoid all kinds of little interactions like leaving voicemails. If you have a social event coming up you're a ball of stress for days beforehand, and sometimes decide not to go; You know you shouldn't, but your anxiety gets to be too much and it's easier to bail. You're insecure and hard on yourself. You feel like you come across as awkward and boring. After conversations you beat yourself for everything you did wrong. Deep down, you can't shake the feeling that you're not good enough. Maybe people have told you you're not as dorky as you think you are, but you can't quite believe it. You're lonely and struggling to make friends. You don't have any friends at all. Or maybe you have a few people you hang out with every now and then, but it's not enough - you don't really connect with them, or you suspect they just let you tag along out of politeness. You've tried going to a few meetups, but that hasn't gone anywhere. It feels way harder to make friends when you don't already have some friends. You're not good at making conversation. You often can't think of anything to say. When you do come up with something you feel like it's not entertaining or interesting enough. It's a mystery to you how people make small talk, let alone enjoy it. In groups you quietly sit on the sidelines. You've tried solving these problems on your own, but you're stuck. Every so often you make a half-hearted effort to turn things around, but those periods come between months or years of procrastination and staying in your comfort bubble. You know a bit about how to fix your issues in theory, but can't seem to apply any of it. Maybe you went through a phase where you tried to convince yourself you didn't care about having friends. For a while it seemed reasonable to focus more on your career or family, but that excuse is wearing thin. You've got a big birthday coming up and assumed you'd have gotten out of your old patterns by now. It's time to make a change. What if all those problems were finally behind you? When you walk into a party or meetup you feel relaxed, and look forward to the new people you'll meet. If you see someone you want to talk to you feel calmly certain you can keep a conversation with them going, and that you'll be able to cover lots of interesting ground. You've got a good group of friends, and know that if everyone moved away you'd be able to meet some new ones soon enough. If you make a minor gaffe you're able to brush it off - You know everyone makes the odd mistake, but overall you're a likable person with solid social skills. You know no one's perfect, but you accept yourself. 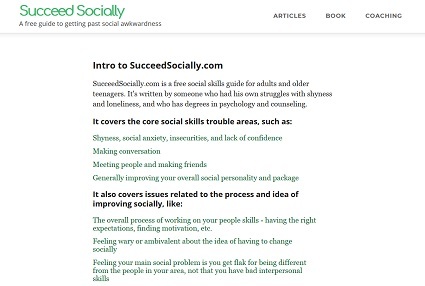 I've been studying and writing about social skills on SucceedSocially.com for over ten years. I'm a licensed counselor. I have a Master of Social Work (MSW), along with an undergraduate degree in psychology. I've gotten through my own struggles with social awkwardness, anxiety, insecurities, and loneliness. I know what it's like. My knowledge isn't just from textbooks. I'm not going to give you a bunch of out-of-touch suggestions I'd never have been able to follow myself. I'm taking new clients. If you'd like to work with me, or just want more info, send me an email at chris@succeedsocially.com with a quick overview of what issues you'd like help with, along with any questions you have. I wish I had a more satisfying answer to give, but it depends. Some issues can be more-or-less resolved in a session or two. Some clients just have a handful of topics they want advice on, and once their questions are answered they're good to go. Other deep-rooted social problems can take months, or even years, to fully address. Sometimes a client has an issue they think will take a while to deal with, but it can be cleared up faster than they expected. At other times a seemingly simple problem turns out to be more complicated. Overall though, if you have a years-long pattern of social anxiety and insecurities, that's not something that can be instantly fixed by a quick pep talk. You've got to put in the work to face your fears and slowly break down your old thinking patterns. That said, you don't necessarily have to be a coaching client every step of the way. With social anxiety around 8-12 sessions is enough to learn the core concepts to keep making progress on your own. The other thing is that coaching doesn't have to be an all-or-nothing choice between not doing it at all or signing on for years. If I'm doing my job then you'll get something out of every session. Even if you only choose to work with me for a handful of appointments, you'll still be better off than you were before, even if you haven't 100% cured every last concern you have. Once more, it depends on where you live. I'm in Ontario, Canada. If you're from Ontario, or the rest of Canada, and have an insurance plan that reimburses you for sessions with a Registered Social Worker, then I'm likely to be covered. Check with your provider ahead of time, of course. I'm not in network with any of the insurance companies in the United States. There's a chance your plan may cover me as an out-of-network provider. Again, get in touch with them and see. Again, if you're interested in working with me, write me at chris@succeedsocially.com with a quick overview of what issues you'd like help with, along with any questions you have. I look forward to hearing from you.